My mom has a great eye for decorating a home. She’s not an interior designer, but I think she may have been in a past life. She poured a lot of time and effort into decorating her own home and gives a lot of tips to her co-workers and friends who ask for advice. When we bought our home in late 2012, we had decided that we weren’t interested in spending a ton of money on home decor, because we’d inevitably get plenty of furniture and small household items from various different sources. We are getting married this year, and we’ll get gifts from that, and we’ve already inherited several furniture items from my mom, my dad, and my aunt. We’re glad we didn’t buy any furniture, or we’d have quite the full house! There are a few things that we wanted to do, however, to make the home more “ours”. After pouring over magazines, TV shows, and soliciting advice from my mom, we nailed down a few things that are fool proof principles to home decorating and finishing. Many people overlook the power of using textures in a home to add points of interest as well as space and a homey feel. Rugs, decor, window treatments, and furniture can all add texture. Don’t use a uniform texture for everything; using wood blinds with shag-type rugs and interesting focal points will help create a visually appealing space. But definitely use them! A house with zero patterns whatsoever – no stripes, no floral, no nothing – wouldn’t be very interesting. I wouldn’t recommend a patterned rug, patterned curtains, patterned cushions and a vase near that that had a pattern, but pick one or two of those things (rug and cushions, vase and curtains) and you will add some visually interesting stimuli in your decor. Having a bland, colourless home is not appealing to many. Don’t overuse colour, though. 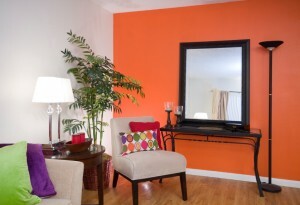 Small splashes of colour here and there, such as a feature wall, can go a long way to bring a space together. Use vases, linens and fabrics, cushions and even small furniture items for the colour you need. On the same note, don’t use the same shade for all of your accent colours. If you want to stick with blues, use navy and sea foam. Even better, using complimentary colour can tie things together quite nicely. One thing we constantly saw on HGTV that the designers always fixed right away was furniture sizing faux pas. Often, a tiny little bedroom would have a giant bed in it. This makes the space look smaller and doesn’t do much for visual appeal. Having tiny furniture in a large room is also not appealing. Larger furniture for larger spaces (as long as there is not too much of it) works best, and use smaller for smaller spaces. This may seem obvious, but it’s something that was constantly coming up. Unfortunately, we have some cords that run from our outlets to our TV that are visible. Cord visibility is not ideal; in fact, you should be keeping cords and electrical wires hidden as much as possible. There are ways to do this in most homes, but we have a sectional that just doesn’t seat the right way for this particular living room, causing cord exposure. It does take a lot away from the room which is too bad. Wherever possible, hide the small things like cords. It’s also beneficial to hide things like DVDs behind cabinet doors. They can certainly make a room look quite tacky if they are out in the open. What home decorating basics have you found work well? My mom usually sews our curtains and she is a really great designer! Cushions really help a lot too, we have a lot of cushion types in every occasion, like during birthdays, Christmas and summer. That’s awesome, it’s nice to be able to save money on things like that by doing it yourself! We just rented a new house not long ago. Anamaria has been all over making it more like home! I’m going to have to show her this article! I love decorating, I’m sure she’s having fun with it.